An AC motor drive decelerates a motor at a controlled rate by placing an electric load on the motor. The advantage in using a motor drive to apply a braking force is that maintenance is kept to a minimum because there are no parts that come in contact during braking. Applications that require a braking force to hold a load for a period of time after the motor has stopped may use the motor drive to stop the motor and a friction brake to hold the motor shaft/load. Friction brakes may also be used with motor drive braking in applications that require an emergency stop function. 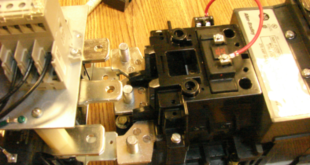 AC motor drives can be programmed for different braking (stopping) methods. 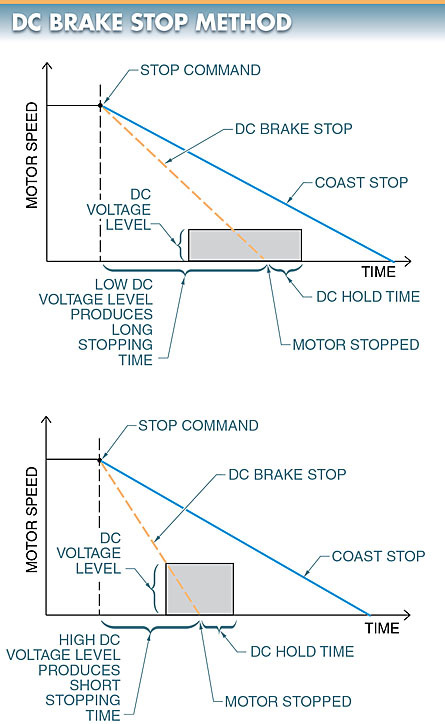 Common AC motor drive stopping methods include ramp stop, coast stop, DC brake stop, and soft stop (S-curve) stopping methods. See Figure 1. Ramp stop is a braking method in which the level of voltage applied to a motor is reduced as the motor decelerates. Ramp stop is normally the factory (default) setting for controlling the braking of a motor. When the motor drive receives a stop command, the drive maintains control of the motor speed by controlling the voltage on the motor stator. This allows for a smooth stop from any speed. The length of time the motor drive takes to stop the motor is controlled by the deceleration time parameter on the motor drive. The default setting for the deceleration is normally 10 sec, but it can be set from a few seconds (or less) to several minutes. See Figure 2. Figure 1. 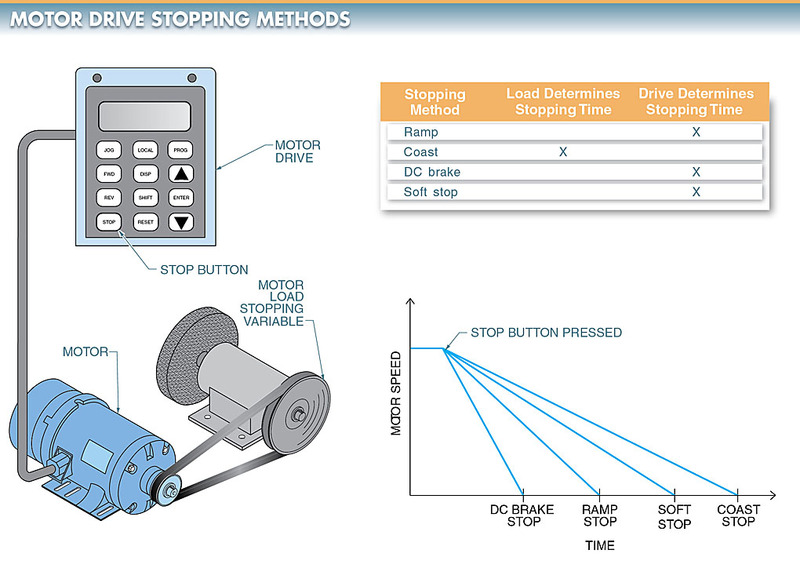 Motor drive braking methods include ramp stop, coast stop, DC brake stop, and soft stop (S-curve) methods. Figure 2. 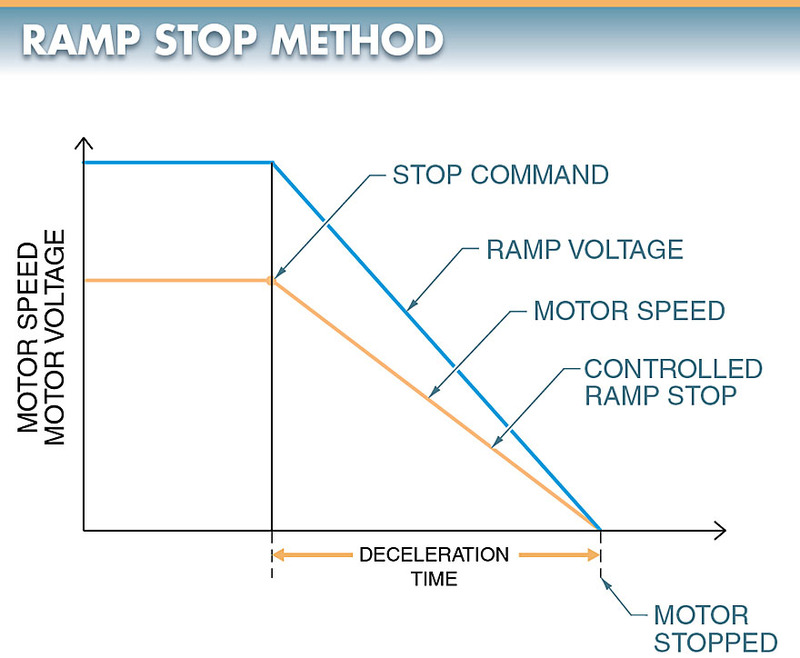 A ramp stop provides a smooth, controlled deceleration by reducing the voltage applied to a motor. Coast stop is a braking method in which the motor drive shuts off the voltage to a motor, allowing the motor to coast to a stop. When the coast stop method is used, the drive does not have any control of the motor after the stop command is entered. The length of time the motor takes to stop depends on the load connected to the motor. DC injection braking is a braking method in which a DC voltage is applied to the stator winding of a motor after a stop command is entered. Unlike ramp stopping, the applied DC voltage is held at the level entered into the DC hold volts parameter on the motor drive. The applied DC voltage is maintained on the motor stator for the length of time entered into the DC hold time parameter on the drive. See Figure 3. Figure 3. In the DC injection braking method, the DC hold level (amount of applied voltage) determines the stopping time of the motor. The DC injection braking method provides a fast stop and can apply a braking force to hold the motor after the motor is stopped. 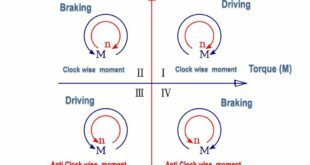 However, the DC injection braking method cannot take the place of a friction brake in applications that require the motor shaft to be held for a long period of time after stopping. 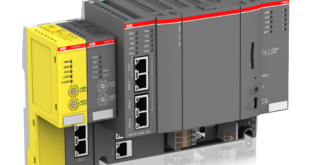 This is because the DC hold time parameter normally has a maximum setting of approximately 2 sec. A longer time period produces excessive heat in the motor windings. 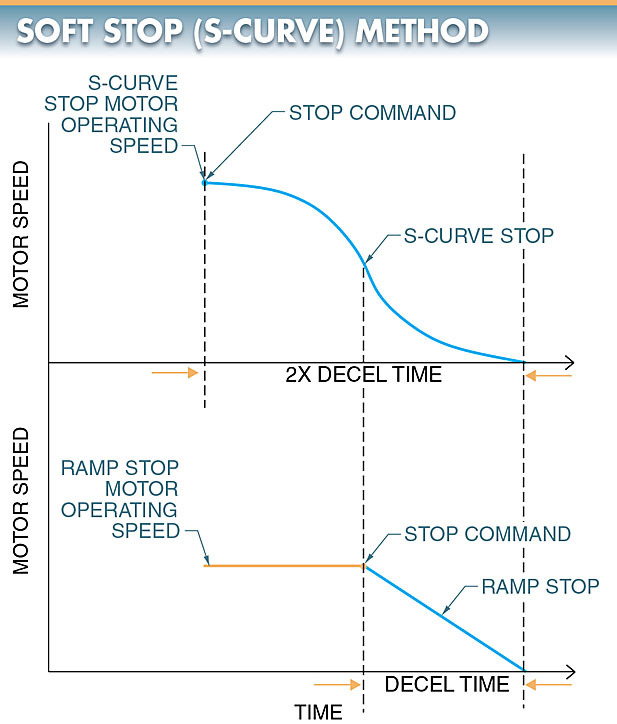 Soft stop (S-curve) is a braking method in which the programmed deceleration time is doubled and the stop function is changed from a ramp slope to an S-curve slope. The soft stop method provides a very soft stopping operation. A very soft stop may be required to prevent light loads (such as empty cans or bottles) from tipping. 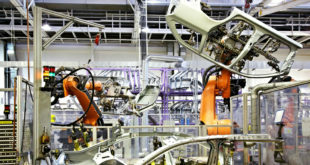 In such applications, the motor drive can be reprogrammed for a soft stop (S-curve) braking method. See Figure 4. Figure 4. The soft stop (S-curve) method has a doubled stopping time and an S-curve slope reduction in voltage.